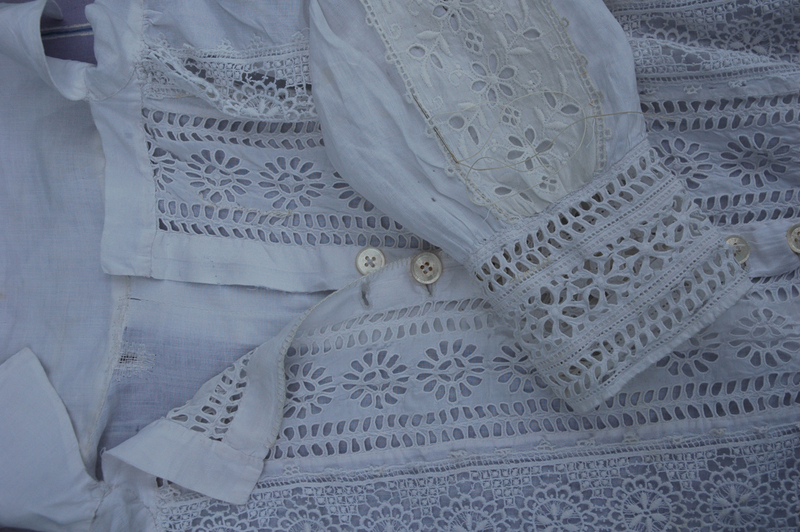 This is my favourite piece of clothing, a Victorian blouse with Broderie Anglaise insertions, all made by hand. I bought it about 15 years ago in an antique market in Bath and have worn it so much that it is slowly disintegrating. I am trying to preserve it by patching, darning and mending all the holes, tears and frayed edges. 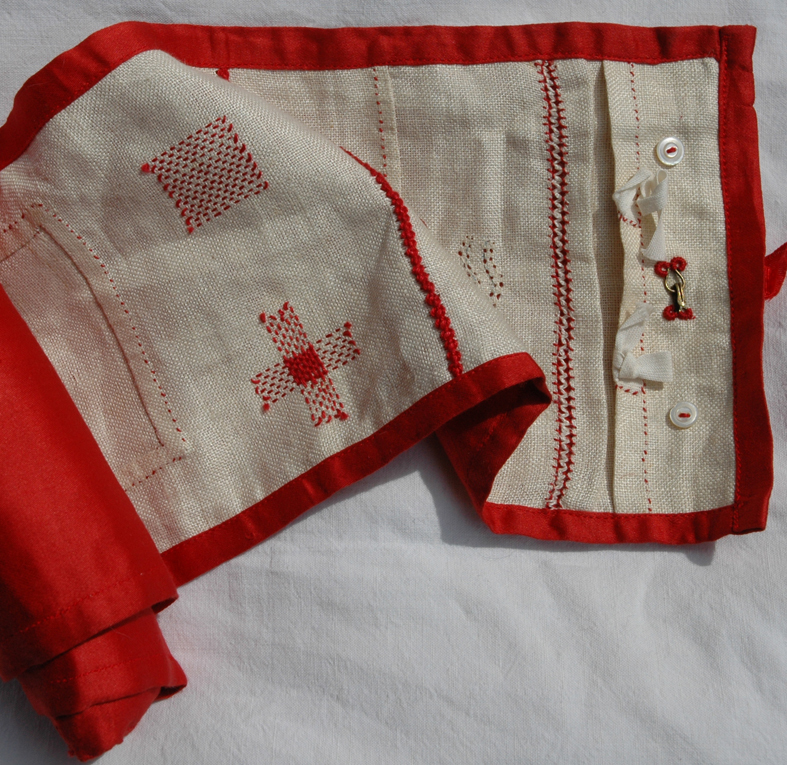 When it first started to tear I inserted extra machine – lace panels, but later I decided to make all the mends by hand. I think that this makes it appear more valued; in our throw away society I feel strongly that mending is an indication of worth. 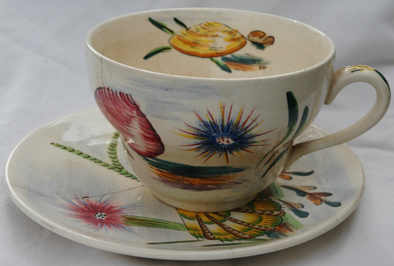 And I have always liked conspicuously mended ceramic and glass items, the metal bands that hold this hand cut and engraved water jug and the hand painted cup and saucer are testament that these pieces were valued so highly by their owners that difficult and expensive methods have been employed to extend their life. 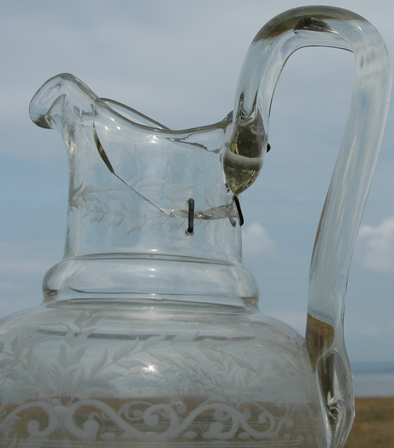 I really bought the water jug because of the rivets, initially I was reassured by this care and attention that it was worth the price I paid and also that I could still use it, which I have been doing for more than 20 years. 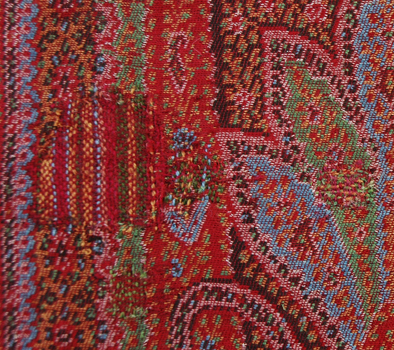 paisley patch, this tiny patch was already sewn in position when I bought this shawl. I really like the fact that the colours don't match but the scale and motif is perfect. paisley darn, this is the simple but painstaking darning I am stitching to mend the holes on a large shawl. Has anyone suffered from the dreaded wool moth lately? My clothes and textile collection was under siege last year. My favourite cashmere woollies (collected at T.K.Max) seemed to be the dish of the day. 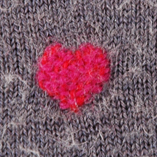 So I am working my way through these and stitching some very conspicuous darns, in fact I am considering making darning designs for the plainer ones – although the tiny heart, .5 cm. wide, the result of a glue accident when I was probable mending something else. 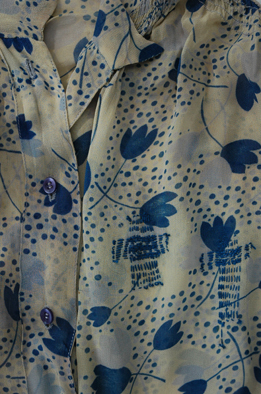 Below are some more of my rescued clothes, an old linen shirt which had pulled apart at the seam and the vintage silk blouse is badly stained, but still lovely. But on reflection – when I was a fashion and textile student at Liverpool Art College in the 1960’s, I made a paper wedding dress, reasoning that it would only be worn once and then could be thrown away. Some 40+ years later I have changed my attitude to disposability and my current embroidery practice revolves around mending, patching, protecting, conserving. 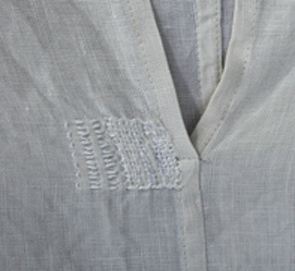 Even a casual look at old sewing manuals will show the change of attitude to mending and preserving clothes and household fabrics, in the books from the 19th and early 20th century there are many and various darning techniques for all sorts of materials. 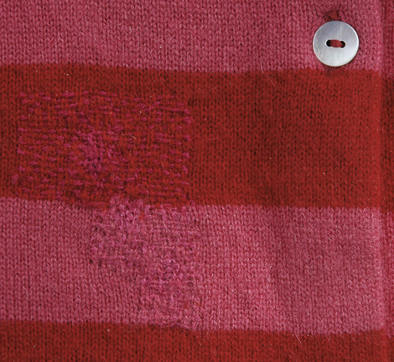 But it becomes apparent that excepting illustrations of Darning Samplers for collectors, this detailed information started to decrease during the 1960’s and by the end of the century mending of any description ceases to be shown in popular sewing manuals. I suspect that the corresponding and continuing rise in the national divorce rate is not a coincidence. 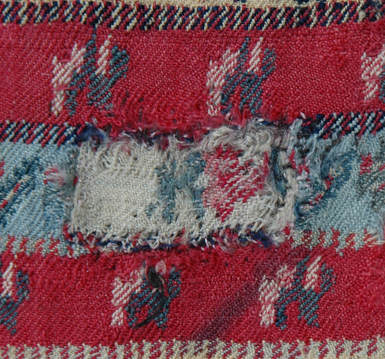 this small sampler was made in a school in England in the early 20th century. Thanks for this I have just had a quick look. It looks fab and is a push to get my blog up and running. I just saw your hard mended objects on here, which is interesting, because I very much like these objects too since finding a couple in Plymouth Museum and I have planned to do a workshop with the applied arts students at Plymouth College of Art called Visible Mendings where we will mend hard objects (either their own made and broken ones or found ones) and make the mending (inspired by textile make do and mend textile techniques) an integral part of the new mended object. Diamond tipped drill bits will be available! Hi Amy, this is really interesting as I am currently working on a stitched collection with ceramicist Hanne Reisgaard. She has been stitching her work for years, but I have offered to stitch for her using my stash of yarns and threads and she is helping me to develop porcelain and paper porcelain plates and dishes; mine are all on the theme of mending as I can tear and cut the clays when working with them and put the holes in for stitching at the same time. Early days as we are still at the sampling stage but I aim to start a new work in progress page for the blog on this next week – so keep looking in. 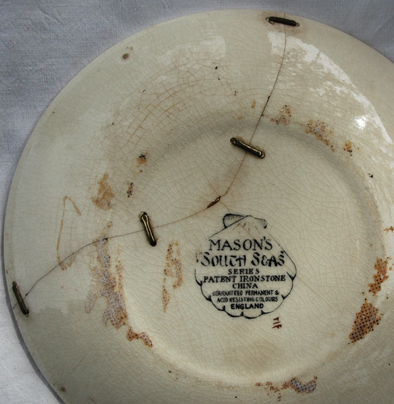 Really loved reading about the moths and the mending of well loved clothes. And funnily enough when I went riding yesterday I was wearing some even older riding boots. My uncle Colin bought them for me when he came over from Canada while I was still at school. The soles are now paper thin and the tops are fairly raggy but I cannot be parted from them. OK j.peg me a a picture of those jodphurs then and we can start a mending archive for much loved things…..any one else out there interested in joining in the mending archive please make comments and I can develop the theme, I have very many darned patched and mended things to still show and there are more to come in my new work as well. I was really interested to read this and the later post about ‘Strangeness and Charm Vintage Boutique’ featured in your post about the Stroud Textile Festival. Mending and darning are something that this vintage boutique is really passionate about. I spent a lovely day in there sitting in the big chair doing some darning! I really love your shawl, would you like to sale it? If not, I’m sorry for asking.